The husband came home last night with a tantalising proposition - I'm going to take you to this shop. It's full of stuff you will love. Of course there was a caveat. I couldn't ask any questions about the shop or what it sold. Now while it was music to my ears it qas also torture not having any clue about this wonderful shop! I asked if we could go the very next morning and the much amused hubby agreed. I tried wheedling information out of him but had very little luck - all he said was " it's not ingredients". I had no choice but to wait. Sigh! I booked us a cab for 7am and we set out for South Mumbai. We picked up our car from our Mazgaon workshop and headed towards Grant road. It was early morning and there were knots of school children all dressed up for Republic Day parades. Loud speakers blared patriotic songs from Hindi movies. I was totally charged up waiting excitedly to reach this mystery shop. And suddenly we were there! A raddi shop! People come and dispose of household junk, old newspapers, plastic ware, etc, in return for a small cash payment. The shop had crates of old china, glassware, wooden bits and pieces, a couple of ugly marble sculptures ans many other odds and ends. And among all this were a few brass things that were out of someone's kitchen. My eyes popped! 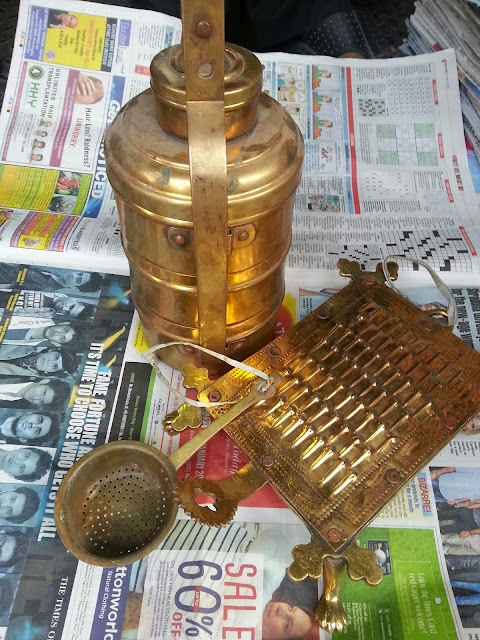 A brass tiffin carrier! A footed grater with a coconut scraper, and a tea strainer caught my eye. It was love at first sight! A short sharp session of quick bargaining and I was the proud owner of all three beauties! The hubby had seen this shop yesterday as he drove past. He noticed the grater hanging in the shop and knew this shop would have treasures for me. I HAVE married really well, haven't I?! You are lucky woman! and you did get get a good treasure.